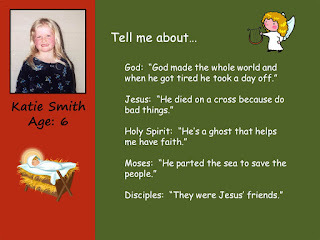 The Carpenter's Ministry Toolbox: CHRISTMAS: Children's Quote Book! If you'd like to create a special gift for parents, take a few moments to ask kids questions about God, Jesus, the Holy Spirit, and various people or situations in the Bible such as the birth of Christ and compile their answers into a book to give parents for Christmas or as an "end of the year" gift. What a beautiful snapshot of what their kids believe at that moment! Remember not to change any of their answers to make them more entertaining or more humorous. That is not the point. They need to be authentic and you might be surprised at the depth of some of the answers! With technology today it would be super easy to take pictures of the children and give each one a page. You can have them write their own name near the picture and then print their responses to the questions. It would also be a great fundraiser for a school! Here's a simple sample of what a page in a book might look like but I am positive there are many creative scrapbook loving women in the congregation who would love to help put something like this together. Sometimes churches will have their own comb binding (GBC) machine but if not a lot of schools have them and might let you go into the school and use it if you provide your own comb spines. If not any local office printing store will have binding as part of their finishing services; some for less than $1 and they will provide the spine. Coil binding will cost about twice as much but some people prefer it to the plastic comb spine. Always call ahead to see if you can get a discount or even have the service donated if you provide your own spines. Be sure not to let your costs get out of control. You can charge a minimal fee to cover costs or if it's a fundraiser be careful about setting your price point. Might make a great calendar too! !